Pieter Johannes De Buys was born on 21 April 1915 at Daspoort, Transvaal, South Africa. He died on 05 July 2003 in Potchefstroom, South Africa. 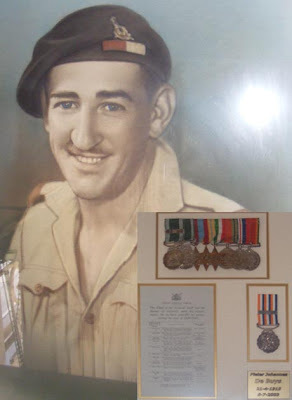 Pieter is my grandfather, left home at a very early age and joined the South Africa Defence Force as painter. Through years of service Pieter was promoted and, in 1935, he was posted at the SAA Castle in Cape Town and was serving as a Bombardier. On 05 February 1938 Pieter was hospitalized for an injury sustained while serving in the 1st Heavy Battery. On 27 August 1939 he was moved from 1 Heavy Battery, Cape Artillery Battery (CAB), to the 4th Heavy Brigade, Durban Garrison Artillery (DGA). Pieter was promoted to a Lance Bombardier on 01 July 1940). 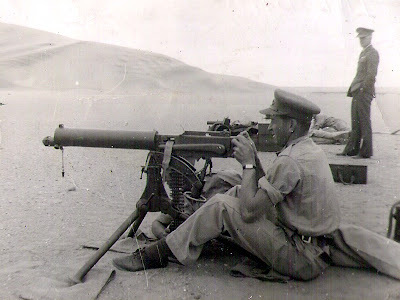 He was then transferred to the Cape Peninsula Artillery Brigade on 12 February 1941 from the First Batallion, Durban. Pieter was transferred to SATE on 19 March 1943 and embarked from Durban with the Pretoria Regiment and arrived in the Suez Canal on 30 April 1943. He departed for Egypt on 30 May 1943. The 6th South African Armoured Division spent a year in Egypt training. Training began in the desert at Khataba, north west of Cairo and was focused on tank operations and integrating the Rhodesian elements into the division. This picture must have been taken at Khataba, north west of Cairo between 30 May 1943 and 3 March 1944. The weapon that Pieter is using is a Vickers heavy machine gun. It was used by the British during World War I, Chaco War, World War II, Indo-Pakistan War of 1947, 1948 Arab–Israeli War, Korean War and the Congo Crisis. From 22 September 1943 to 01 October 1943 Pieter was placed on the x2 list and hospitalized with sandfly fever. He was discharged from hospital and taken of the x2 list on 01 October 1943. He rejoined the Pretoria Regiment upon being discharged. On 30 October 1943 Pieter was sited for contravening Section 40 (1) of the Military Disciplinary Code. This was for a minor offence contrary to the good order and military discipline. Pieter was crossposted from 6th South African Armoured Division (prov. coy (v)) to the South African Corp Of Military Police (SACMP) on 24 May 1945. On the 09 September 1945 he left Italy for Egypt and remained there until March 1946. Pity he was such a hard man in life and never spoke much to anyone about his "exploits"
Excellent research work there; Thanks to all involved.